The book that is the definitive guide to a natural lifestyle for dogs and cats is now completely updated and revised - for the first time in 9 years. 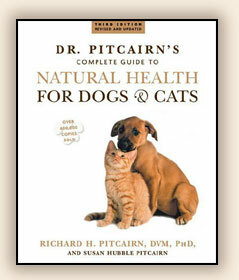 Writing with the warmth and compassion that have won them national following, veterinarian Richard H. Pitcairn and his wife Susan Hubble Pitcairn, noted specialists in chemical-free nutrition and natural healing for pets, show dog and cat owners how to provide the very best in companionship and lifelong care. They now cover environmental matters, including pollutants both inside the home and out, as well as recent hot-button topics, such as Mad Cow disease, Lyme disease, and the West Nile virus. They've updated dozens of recipes for delicious and healthful pet food and treats. With a guide to handling emergencies and an in-depth "Quick Reference" section, they give specific instructions for preventing, diagnosing, and treating a wide range of animal diseases and disorders - with special attention to homeopathic, herbal, and nutritional remedies. For more than twenty years, this classic guide has been equally invaluable to both veterinarians and pet guardians alike. Make this your first choice in raising your pet in the most natural and healthy way possible. Richard H. Pitcairn, DVM, Ph.D., opened the Animal Natural Health Center, a clinic offering only holistic animal care, in 1985. Recently retired from practice, he teaches post-graduate courses in homeopathic medicine to veterinarians. Susan Hubble Pitcairn was a major contributor to the first two editions of this book. As the third edition goes to press, she is splitting her time between artistic pursuits and the support of positive social change.